Air bubble construction absorbs heavy impact. Bubble film rolls help keep your delicate items intact. 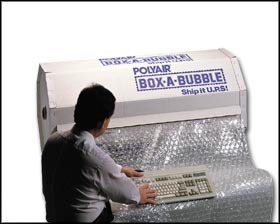 Lightweight for reduced shipping costs. Completely reusable. Conveniently cross-perforated every 12" for ready-made sheets. FDA approved. Ships via truck only. FOB Shipping Point. Product No. Roll Size Bubble Height No. Rolls Per Ca. Wt. (lbs.) Ca. Price Per Ca.